As of now, I am done with my presentation. Today’s lunch was non-pork (!) and i relieved and happy. – You have become a major personal brand. Are there any tips for us like a person who has only 20 followers? Just be yourself! Don’t be ashamed to be yourself. Don’t overpromote yourself. Failure is all right. You might fail from time to time. Matthias Lüfkens, social media architect at the World Economic Forum, aspires to inspire. After bringing Davos to the world for five years, he now brings the world to Davos through his innovative use of social media, YouTube, MySpace, Facebook, Flickr, Wikipedia, Qik and Livestream included. Previously a journalist, he was Baltic States correspondent for Agence France Presse, Libération and the Daily Telegraph (1991-96); and later Deputy Editor-in-chief of EuroNews television (1996-2004). 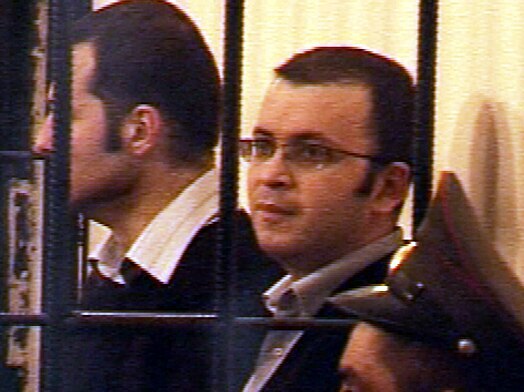 Youth activists Emin Milli and Adnan Hajizade at an October 9 court appearance;Bloggers Emin Milli and Adnan Hajizada have been sentenced by an Azerbaijani court to at least two years in prison on hooliganism charges that the defendants and rights groups have dismissed as politically motivated, RFE/RL’s Azerbaijani Service reports. Pedja is actually doing business through his twitter and facebook account! Pedja PUSELJA ? Blogowski – Blogger and independent web-consultant. After years spent as a webmaster and front-developer, he made a career-change and professionally dedicated himself to a personal passion: social media and online identity. He is probably one of the best Twitter, video-blogging and IT evangelists on the territory of the former Yugoslavia. Onnik asks how the Statement of the Forum is written out now… First drafted by the organizers but we will be working on the final form on a wiki site….After the Azeri bloggers sentenced this morning, some bloggers demand a stronger worded Statement. I wonder how will that happen since the President of Romania is one of the sponsors of the event. Can bloggers’ statement is significant that might anger Azeri gov’t against Romania?